As a free-range CMIO, organizations often hire me to do work that they should be able to do themselves. Sometimes there are valid reasons why they can’t, such as the unexpected departure of a key employee. More often, though, it’s due to lack of organizational structure or even outright chaos. I was working with a group in the latter position this week, putting together a plan to try to get them back on their feet. It’s a mid-sized group of employed physicians associated with a mid-sized hospital. They were initially referred to me by one of their physicians after we met at a conference. I knew I would be in for an interesting time after the first discovery call. I usually set up a meeting or two to figure out who the key players are and why they think they need assistance. The calls usually reveal that why they think they need my help is not actually why they need my help. More often than not, they think there’s a problem with their software, or that they have problems with individual physicians refusing to get with the EHR program. When we start to talk about the specific concerns, it tends to show that they have problems with communication, resource allocation and prioritization, or perhaps strategic planning. If I’m lucky, it might be a project management issue. This time it was all of the above. The first time we tried to do a discovery call, only one of five client attendees bothered to show up. The second time, we had several “leaders” (and I use that term loosely) attend, but two of them had no idea why they were on the call or why the organization was seeking outside help. We spent the first half of the call with one of their internal IT resources trying to explain to them who I was and why they had contacted me. Ideally that would be done before we all get on a call together, but then again if they had their act together, they wouldn’t need my help. We talked about their key concern of “we’re not going to get Meaningful Use” money and did a quick exercise to determine root cause. I love techniques like the Five Whys for their simplicity. The premise is that you can get to the heart of an issue by asking why something occurred, then following each answer with another “why” question. Usually after three to five repetitions, it becomes clear what the real problem is. People are often astonished when you start identifying the real reasons behind their situation. Of course, there are a lot of other formal methodologies you can use to do a true root cause analysis, but when there are “soft” issues at play, the Five Whys is usually enough. The operations team, on the other hand, feels that IT coddles the physicians and that the customization interferes with their ability to control the providers. The finance team thinks the whole thing is too expensive and the consultants they’re using to customize the system are laughing all the way to the bank. I’ve been working with them for a couple of months to put together a proposal and actually get them to approve it. Through that process, I was able to identify that they have some pathological corporate policies that certainly aren’t helping things. One major issue is their email retention policy – all emails delete after 45 days unless they’re manually archived. I don’t know about you, but I certainly don’t have time to go through my emails on a regular basis and manually archive things on that kind of cycle. My former employer had a six-month retention policy, which was reasonable – after six months, you know whether something is archive-worthy (and they actually had a class in how to best manage folders and filtering to make the retention policy easier). These folks just leave their employees hanging. Inability to manage and retain emails led to a lot of requests to resend documents and repeat conversation threads that we thought were already resolved. It also was instructive in warning me that I needed to dramatically increase the block of time that I was planning to allocate to this client. Once they accepted the proposal, I was able to do a fair amount of remote work with them while we waited for calendars to open up for our first onsite visit. I had requested documents related to their organizational structure, roles and responsibilities, contracts between the client and their EHR vendor, and service level agreements between IT and their internal customers. Although it took weeks to get some of the documentation, eventually most of it turned up. What surprised me (but probably shouldn’t have) was the lack of awareness of some parties regarding their own documentation. Interestingly, no one could actually produce the policy about the 45-day email retention standard. Needless to say, unless they can validate why they want to allow that to contribute to their dysfunction, I’m going to push to lengthen it. This week was my first time at their offices. I had scheduled a number of one-on-one interviews with identified members of their leadership. Usually I walk through an interviewee’s understanding of the EHR initiative and its purpose, what they think is in it for them, what they hope it will accomplish, etc. For the first few interviews, I felt like I should be charging behavioral health CPT codes because the leadership interviews turned into therapy sessions. I felt like I was in junior high school again, but instead of dealing with cliques and mean girls, I was dealing with organizational silos and power-hungry players with grossly inflated titles. Of course, most of them want me to just jump right in and “fix the EHR.” Having been in this game for a fair length of time, I know that without putting the right leadership structures in place and making sure we have functional processes to sustain any changes to EHR content and workflow, we might just worsen the chaos and make the physicians even less happy. Once we identify who the decision-makers will be and what the strategic goals are (besides just “get that MU money”), we’ll be able to really figure out how to solve the problem. I wasn’t able to finish all the interviews last week (of course, many “emergencies” prevented people from attending, but they wouldn’t tell me what those urgent problems were) so I do have some phone interviews to finish this week. At least I won’t have to hand out tissues since we won’t be in the same room. I also don’t have to worry as much about maintaining my poker face when the stories of one department slighting another get petty or silly. Once the interviews are complete, I’ll deliver a formal assessment and recommendation and we’ll see how it is received. 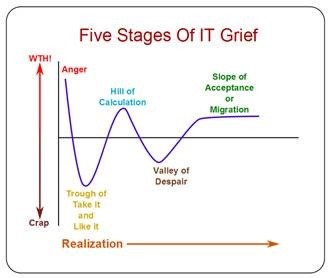 Having done this more than once, I know they’ll go through some of the stages of grief (particularly denial, anger, and bargaining) before we can arrive at a real plan to move forward. They have some strong physicians who seem to be buying what I’m trying to sell. They’re not ‘titled’ leaders, but rather informal ones, so I’m hoping they’ll be able to help drum up some grassroots support. The titled leaders will be a bit of a challenge, but I’m hopeful that the burning platform of MU will help move them in the right direction. What is your current stage of grief? Email me. I would love to hear about effective leadership teams and how they become that way. I am not part of our organization’s leadership, but occasionally interact with them (and also hear info from people who more frequently interact with them), and it just seems that the more layers we add – VP, SVP, EVP – the more work is created without true hierarchy and responsibility. We don’t even have a clear IT leader. Is it our VP of IT? Our Chief Innovation Officer, who replaced our Chief Information Officer, but who seems to have limited interest in core IT functions? Our new EVP of “peripheral” services like IT, Finance, Pharmacy, etc? God only knows. And yet even with an expanded leadership “team,” they all give the impression of having too much on their plate to concentrate at the issue at hand or even, yes, show up for meetings (much less on time! ).